Dean Mattson, director of the Wood Manufacturing/Cabinet Making Program at North Salem High School, Salem, OR, received the 2013 WMIA Wooden Globe Award as Educator of the Year. His program is affiliated with the Woodwork Career Alliance, under which students can begin formal skills credentialing while in school. Here is acceptance speech at the 2013 Wood Industry Conference in Phoenix in April. I was sitting at my desk counseling a student whose foster parentstold him he wasn’t good enough to get one of our industry’s contracts when my iPad beeped and I looked at the screen and it said, “Congratulations! You are the winner of our Educator of the Year Award.” I said, “Holy $#&@! We won!” My student said, “Mr. Mattson, you just said a bad word!” I was shocked and speechless. I would like to go back a few years ago and start there to answer this question. In 2007, my late wife, Ann, was stricken with cancer and passed away. Shortly after that trial came the financial crises of 2008, and my cabinet manufacturing company lost a great deal of work when the stock market crashed. I was forced to reinvent my life. The reinvention started by meeting a remarkable lady named Rosemary. Rosemary lost her husband years ago to cancer, as well. Rosemary allowed me to date her, fall in love with her and she graciously became my wife. Our families joined together to make one new family and we now have four new grandchildren. We feel extremely blessed. But my career still seemed to be empty. Rosemary, a most gifted teacher began to heighten my passion for teaching. I thought about the eight years I had volunteered teaching at Oregon State Penitentiary, helping men re-enter society. I was beginning to think of pursuing some form of teaching. Then a call came that asked for my help in finding a replacement for the legendary woods teacher David Anderson who was retiring at NSHS after 30 years. Six months later I was awarded the job. Like many woods programs around the country, this one was shrinking. It had become for the most part a dumping ground by counselors and administrators for problem kids. I was extremely frustrated. It was an uncomfortable environment with all the dangerous outdated equipment to manage. I had nightmares of cut-off hands. As a former marketing professional and an owner of a cabinet manufacturing company, I needed to change the image and produce products that young people could embrace. I needed to react quickly, but that is not the norm for public education. In addition to this, NSHS is a Title I school with a poverty culture and over 20% of the students are homeless. I struggled to grasp the way to turn this program around until I had a conversation with one of my students. During the first six weeks of my first semester sat a quiet Hispanic young lady whom we will call Mary. Progress grades were due and Mary had all D and F grades. I decided to sit down next to her and see if she would talk to me. She did not say much. I told her that I wanted to give her a C- but she had to turn in her work and would work with her to help her finish her basic cabinet project or she would fail. Mary said she would try. She began to respond immediately. At the end of the semester when we graded her cabinet, she received a B grade and Mary had tears running down her cheeks. Mary said it was the best grade she had ever received. I, too, was encouraged and I thought maybe I could become an acceptable teacher. The next semester’s Cabinet Making 2 project was a solid stock, mortise-and-tenon table that measures 16x16x16 inches. Mary went on to ask Mrs. Mattson and me if we would be her Mom and Dad at graduation exercises. Two years later, this remarkable young lady returned to my classroom and told me she was a secretary, earned enough money to rent an apartment for her siblings and she would never have to work in the cannery again. Following this experience I became a driven and passionate proponent for youth. I developed a vision and implemented the vision with the help of many people. I wanted students of all colors, English language learners, first generation Americans, any student, to have the chance and the experience that Mary had. I ramped up the program using Lean Manufacturing principles. I contacted all the business partners in the industry that I have worked with and told this story. 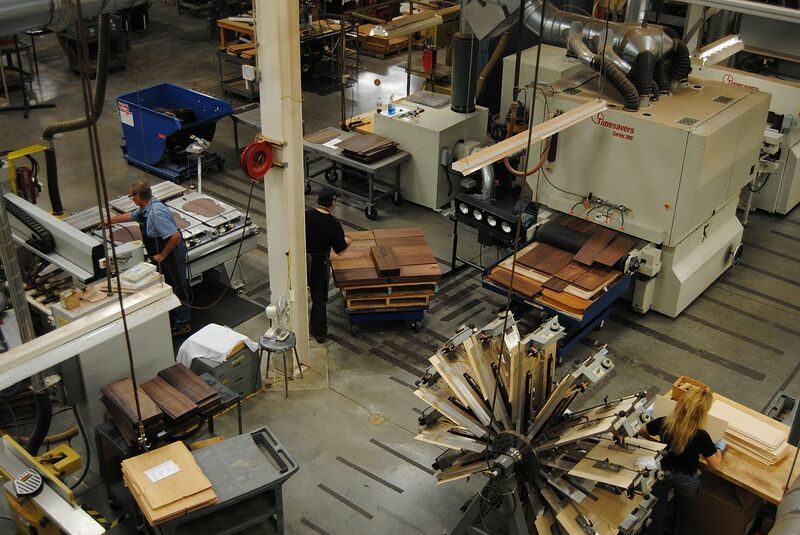 They opened up their check books, sent truckloads of supplies to grow our program into one of the largest woodworking programs in the country. To date, more than $600,000 has been raised for the program. This along with the support of Salem-Keizer School District has been enough. I continue to sell the vision to anyone who will listen. At a regional WoodLINKS seminar on a furlough day, I spoke about our program. Joe Wadsworth, an employer and owner of Custom Source Woodworking out of Olympia, Wash., started talking to me. He was so thrilled with students being taught integrity, finances, math, woodworking and what employers are expecting from the workforce. He and his partner, Jim Mammina, havehired all of our graduating seniors that have wanted to into the woods industry. It has changed his organization so much so they say it is their edge in a tough market. He said they went from a 98-percent failure rate with off the street hires to 50 percent with my students. This year, more than 400 students will move through the Cabinet Manufacturing program, and there are hundreds on a waiting list. Students suddenly want to be educated in math, reading and writing. Many students for the first time have the motivation to learn. Because mathematics plays such a large role in educating our youth, we sought out a grant to bring a leading math teacher, Mr. Mark Atkinson, into our program this springto write new math curriculum using woods as the core curriculum and math as the elective. Many of our students for the first time believe they can go to college or directly into an industry that is screaming for quality young people to bring back manufacturing in America to its place of prominence. Last week at the EBC in Chicago, the number one need of industry companies large and small is trained youth. This is why in our opinion, Career Technical Education (CTE) is so important to the future of America’s workforce. Here is a quote from Jonathon Adams, COO of the Adams Group from North Port, Fla.
Good evening, Dean. It was a pleasure meeting you at the Stiles EBC the last few days. I enjoyed learning about your program. I would like to continue to learn more and possibly become one of the companies who recruit your students for internships and eventually full-time employment. Please keep me posted on your progress and perhaps I’ll plan a trip to come see your program sometime later this year. I read this email to all my current 240 students. They walked out of the classes with a sparkle in their eyes and a swagger I had not seen before. This award makes these underprivileged students national champions. They are beginning to feel like winners when all society and even sometimes their families have told them they are not. It is our goal to share this model of CTE education with any organization that believes that this is a key to the future of education in our country. It has been written in publications all the way to Wall Street that this is an important breakthrough. If you think it is, please pass this on to prominent people in education, industry and in Washington, DC. You are the industry leaders of machinery. Programs like mine need state of the art equipment to train the future leaders of our industry. You want to create a market edge. Place your machines in prominent educational programs and let them sell for you 24-7. It is the least costly marketing with the biggest ROI you can have. Your competitors will be wondering what happened. Join me on the cutting edge. It is where the action is. I sacrificed my company for youth. What can you do? On behalf of the fabulous young people of North Salem High School, the teachers, the volunteers, the administrators, the industry partners, the investors and most of all those that pray for these children every day,and myself … thank you from the bottom of this man’s heart.